Hey! I know why you are here, you are here for the giveaway hop hosted by I Am A Reader, Not A Writer. Good news, you are in the right place. Below is a picture of some of my favorite books I read in 2012 and one winner will get to choose one of the pictured books! Please read all the details before entering. Good luck! Oh, so many good reads! I've read or own most of them, and Iagree with most of your choices! But I haven't read OR both CURSED by Jennifer L. Armentrout - so I'd pick that one. Thanks so much for the giveaway! Wings of the Wicked by Courtney Allison Moulton! I would really, really, really love a hardcopy of Throne of Glass - it's calling my name - and I can't resist ;) Thank-you! I'd pick Finale. :D Thank you! I'd love to choose Shadow and Bone :D Thanks for the giveaway! Hmmm, Opal OR Throne of Glass, I thing. So hard, so hard, damn it. So many delectable choices....I'd choose City of Lost Souls, Insurgent, Shadow and Bone, Throne of Glass, or The Iron King. So many good books to choose from! Probably Insurgent or Throne of Glass. Thanks for the giveaway! Thanks for the giveaway! I am stuck between Obsidian and Delirium! I'd pick Anna Dressed in Blood. Thanks for the giveaway! Thanks for the giveaway! I'd love to win Shadow and Bone. I'd probably pick Pushing the Limits. =) Thanks! 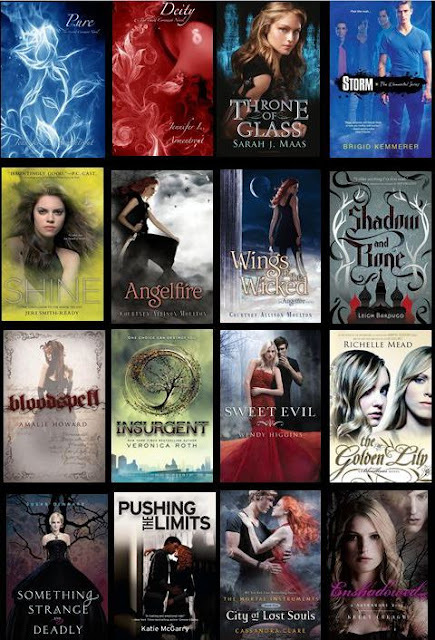 Thanks for this amazing giveaway - I would love to win and pick Throne of Glass or Greta and the Goblin King! I'd love Touch! Thanks for the chance! Maybe Sweet Evil? Such a hard decision! Soooooooooo many good choices! I was like, "ooooooohhh, I want this one! No this one! Noooooo...this one!" and I hope I'm making the right choice here, but I'm going to go with Sweet Evil. I think I would choose Delirium or Angelfire. I would probably chose Storm. I'd choose Finale. Thanks and Happy New Year! I'd pick Shift or Finale. I would pick Shadow and Bone. Shadow and Bone for me as well. Something Strange and Deadly- great giveaway! Thanks for the giveaway! I'd choose Finale by Becca Fitzpatrick! I really need to find out what happens in the last book. New follower via GFC. 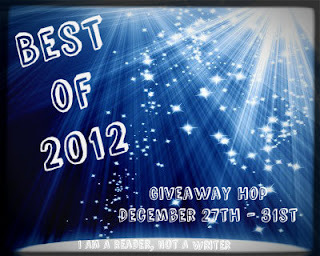 Stop by my blog to enter my giveaway! I'd like to read Shadow and Bone! I would have to choose between Obsidian, Something Strange and Deadly, or Sweet Evil. I'd love to read Silence. I would choose City of Lost Souls! I would choose Shadow and Bone. Thanks for the giveaway! Thanks for the giveaway! I would love Deity! I would choose Shadow and Bone. I honestly have no idea. There are 7 that I want and I don't know how to choose between them! I'd probably pick Obsidian. Or Greta and the Goblin King. I would LOVE to complete my series with Opal! I really don't know what to choose.8 of them are in my wishlist. Maybe Throne of Glass or Storm... Thanks for the great giveaway and for making it international! I'd either pick Cursed or Something Strange and Deadly. So difficult to decide! Maybe Obsidian or Finale. I'd love to win Something Strange and Deadly. Opal :) thanks for the giveaway! Probably Anna Dressed in Blood. Thanks! Deity or Shadow and Bone! There are too many options! I would probably go with Throne of Glass. I'd probably pick Onyx or Sweet Evil. Thanks for the giveaway! Delerium. Thanks for the giveaway. I would love to read Storm. Thanks for the awesome giveaway! I would like to choose Insurgent. Thank you! I would love receive Sweet Evil or Shadow and Bone! I would choose Something Strange and Deadly! I would choose Pushing the Limits :) Thanks for the chance! Thank you for the giveaway, I´d choose Pushing the Limits. I'd choose Throne of Glass! I'd love something strange and deadly. I think I'd choose Pure or Deity. thank you for the giveaway and Happy New Year! I would choose either Greta the Goblin King or Throne of Glass or Storm. This is a hard choice, there are a few I can't wait to read! Probably Shadow and Bone. Thank you!! I'd definitely pick Something Strange and Deadly. Shadow and Bone looks interesting. id choose throne of glass! Wow what awesome choices! So hard to choose...it's between Cursed, Anna Dressed in Blood and Throne of Glass. Thanks for the awesome giveaway! Thank you so much for your generous participation in this fun hop. There are so many treats listed that I would love to read. I recently read Bloodlines and would love to read The Golden Lily. I'd love to win Enshadowed! It was a great book! I think I would choose City of Lost Souls. I'm thinking SS&D. I haven't read it yet, though everyone seems to love it. Hard! Hard! Hard to decide. I think Touch or Pushing the Limit. Thank you for the giveaway. Happy New Year. Delirium! Thanks for the giveaway!! I'd go with Shade.Thanks for the giveaway. I think I'd choose Opal! Great choices:) Thanks! I would love to win Finale by Becca Fitzpatrick. Most likely, Onyx or Something Strange and Deadly. Most likely Greta and the Goblin King or The Iron Knight. I would probably pick Shine. I think Throne of Glass. Thanks for the giveaway! Maybe something strange and deadly! I would choose Shadow and Bone! Thanks for the great giveaway! I'm not sure! Maybe Cursed!! I'd pick Finale. Happy New Year! 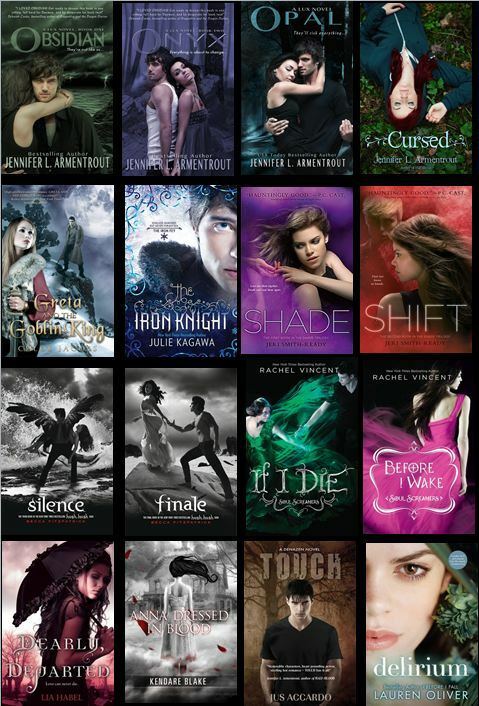 I would choose Opal, Insurgent or Deity :D Happy New Year! I think Opal or Before I Wake! So many great books to choose from ... at first glance, I'd likely pick Throne of Glass :) Thanks! I would love Dearly Departed!